It’s a new season, meaning we have a new list for you with some tasty tidbits featuring what’s just opened (and what will be opening soon) in time for spring. There’s a lot of sweets on here, which means the Easter Bunny might not approve, but we can assure you that there’s also plenty of savoury fare too. Angela Farkas and Alana Fiks just keep doing awesome things. Farkas is the former pastry chef at ERA Bistro in the Canadian Museum for Human Rights, during which time (back in 2015) she teamed up with Fiks and started making gourmet handmade ice pops that became all the rage at pop-up events across the city. That venture, Pop Cart, became a mobile cart phenom of sorts, taking over Winnipeg Instagram during the summer months because everything they made was just so damn tasty and colourful, with super fruity, hand-squeezed flavours like Arnold Palmer and pineapple ginger, along with more decadent numbers like salted caramel. 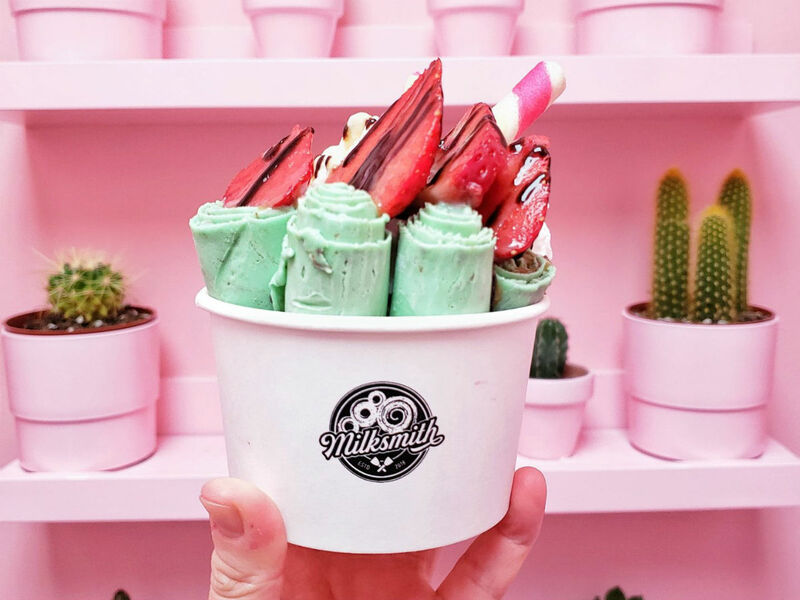 They now have a store to call their own where you can get these pops, along with plenty of other amazing things, like their own brand of small batch ice cream – including vegan varieties. But it’s not all just sweets. On top of what they themselves make in the store’s commercial kitchen – which includes soups, salads (both leafy and the bound variety), compound butters, and spreads – Black Market Provisions also works as a best of Winnipeg’s baking scene, with sourdough breads and cinnamon buns from Eadha Bakery, and pastries from Hildegard’s Bakery. They also carry fancy salts, spreads from flora & farmer, and Smak Dab Mustards, among other tasty things. Their slogan is “stay steamin’” – so you best believe that these buns are hot. This new restaurant, which opened in March, is an extension of the food truck, which had its inaugural run last summer. Their main bag is baos, done in the style that David Chang made famous in North America, in that the buns themselves are used more like a taco shell, as opposed to wrapped around the filling and pinched at the top to form a ball before being steamed. The baos here are vibrant and just begging to be out on Instagram, topped off with smatterings of spicy aioli, scallions, cilantro and julienned carrots and cabbage for crunch. Their most-popular baos are the Peking duck and pork belly varieties, while the menu doesn’t just bend to baos, in that they also do Japadog-style hotdogs (served in a sesame bun), steamed bun veggie sliders, lumpia, sushi towers (sashimi, avocado and roe stacked on rice and sauced like a boss), and Korean and Japanese-influenced poutines. Winnipeg’s newest – and now fifteenth craft brewery (here’s the full list, plus distilleries) – officially opened on March 9 in Fort Rouge, just a block back from Confusion Corner – and it’s already been rocking. Owner Andrew Sookram is an experienced and award-winning former home brewer, and right now their lineup includes the MacGuffin California Common (which the Internet tells us utilizes a special strain of lager yeast – think Anchor Steam from San Fran), the Desert Island IPA, and a pilsner by the name of Cult Classic. On top of that, they are just about to release a sour called Cosmos (which comes out today), with more flavourful brews in the works. Along with pints and growler fills in the tap room, you can also now find their MacGuffin and Desert Island in can form in vendors around the city. Join us in the taproom tonight for a pint of MacGuffin California Common. Our doors open at 4pm today - come say hi to Andrew & Colin behind the bar. Also don’t forget, we may not have a kitchen in house but you can bring in your own food or order @skipthedishes to the taproom! Forget about just bringing boys to the yard, these milkshakes having been bringing in all the crowds to roost right under The Roost on Corydon. If there was such thing as milkshake mixologists, owner Siuleen Leibl and beverage director Dustin Nguyen would fit the bill. At the shop they don’t just blend ice cream with milk, they instead take their cool creations to the next level by adding house made syrups, utilizing bitters and adding fragrant and flavourful foams and fresh squeezed juices to many of their soda style drinks. They also create rolled ice creams (made right before your eyes), serve hot beverages, sling ice cream tacos (in a waffle taco), and waffle pops – the base of which is also made onsite. If all of this doesn’t sound sweet enough, all month long you can take in Ciao! Chocolate Fest. During this time at participating restaurants that include Corrientes, Inferno’s Bistro, La Belle Baguette, Little Goat, Loft 180 at McPhilips Station Casino, Mordens’ of Winnipeg, Nicolino’s, The Oakwood, Panda Tea, Saddlery on Market, and Tuxedo Village you can get decadent, chocolate-focused dishes for $7. You can find all the dishes here. Remember when we wrote about Patent 5 Distillery in our winter listicle? Well, it’s now up and running in full swing with a tempting line up of cocktails to try in their tasting room. Our pick is the Toast ‘n’ Jam — a creative twist on a classic old fashioned with butter-washed bourbon, toasted sourdough tincture, house orange bitters, and a rich raspberry syrup. You can also read about how they are making their vodka and gin here, in our first update from January. •	The Red Ember – they of the local legend chewy-yet-crispy crust dotted with ingredients that mainly come from Zinn Farms – is set to open a New York Style pizzeria at 753 Wall Street called Wall Street Slice, serving both 18” pies and slices which we demand that you fold in half before shoveling in your mouth. This will take the Red Ember’s tally up to three, with a roster that includes their huge red food truck – where pizzas are cooked on a wood-fired oven, and Red Ember Common – where the pies are baked in a gas-fired Izzo forno oven from Italy at The Forks Market. And hey, just how great is Wall Street? Along with the aforementioned Slice, you also have amazing breads and pastries from Sleepy Owl, and some of the country’s best beer at Barn Hammer (yup, we went there). We’re pleased to announce that @tyronewelchinski will be joining the Nonsuch family full-time as our Executive Chef. To celebrate, this coming First Friday Tyrone will be preparing some tasty snacks as well as a new brew from our Head Brewer Mark Borowski. It’s a special release of our Belgian Dark Rye Ale with Brettanomyces. This beer will be available in bottle format as well as on tap for a limited time. The food starts serving at 5pm but the taproom is open at 1pm if you’d like to stop in for an afternoon beer. •	A full food menu at Nonsuch Brewery will be in full swing next month from chef Tyrone Welchinski, who was the original chef at King + Bannatyne. Welchinski does great work with meat (obviously), while we’ve always loved the dishes we’ve had of his at RAW:almond and other pop-ups that have a very Central/Eastern European feel to them (he loves to cure and makes a mean perogy), so we’re pretty excited to see what he does at Nonsuch, which has some amazing full-bodied beers and one beautiful tap room. •	Finally, while we’re on meat and sandwich shops, Miss Browns just announced that another restaurant is in the works that will focus on even more amazing smoked meat. We’ve had sandwiches so good from their shop at 288 William that we’ve literally been brought to tears (both while eating and while describing them later) so this is exciting news that we’ll keep you updated on.